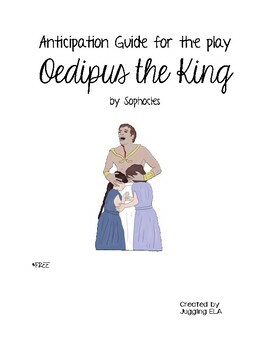 This is an anticipation guide to use with your students prior to reading the play Oedipus the King by Sophocles. Anticipation guides are a great pre-reading activity. In an anticipation guide students respond to various statements that in one way or another relate to the play. These statements are meant to prompt a class discussion about topics relating to the play. I find that anticipation guides get the students interested in the book before they begin to read it. There is no answer key because students are stating their own opinions.